Perfection of Wisdom Sutra in Eight Thousand Lines (Skt. Aṣṭasāhasrikā Prajñāpāramitā; Tib. ཤེར་ཕྱིན་བརྒྱད་སྟོང་པ་) (Toh 12), consisting of 32 chapters, is, according to scholars, the earliest of the Perfection of Wisdom sutras. 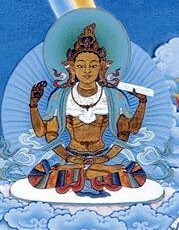 Its popular verse summary is known as the Verse Summary of the Prajnaparamita. This page was last edited on 27 April 2018, at 19:15.